Obtaining a Ladbrokes bonus is a fairly straightforward process for new customers interested in sports and casino game promotions. But, as ever with welcome bonuses offered by bookmakers, there are various terms and conditions that bettors need to be aware of before committing their money. Here, we look at a variety of welcome bonuses available, and scrutinise the various Ladbrokes terms to take into account for each. Wager £5 or more for a matched free bet up to £50. New customers who stake at least £10 get a £50 bonus. Get your first deposit doubled, up to £1200. New users on Ladbrokes can claim a bonus when they register with a promo code. However, their Ladbrokes sign up offer is not the only promo that becomes available with the activation of a promo code. The table below provides a quick overview of all promotions that can also be claimed by new players. Click the button following this list to be redirected to the operator’s official site. Click “Join Now” on the top right-hand corner of the screen. Fill out the registration form with the correct information required. Type in the sign up promo code the corresponding box. 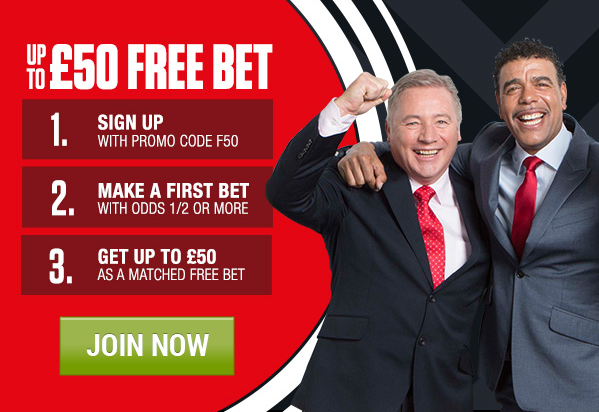 As with most online gambling operators, there is a Ladbrokes bonus available for new sports betting customers, which is delivered in the form of a free matched upon sign-up. Customers need to register, deposit funds and place a minimum first stake of £5 or more, and in turn receive a matched free bet for the same amount wagered – up to £50. Click the button above to sign up for a new Ladbrokes account. Enter correct promo code when prompted. Deposit a minimum of £5 into your account. Place a single or single line accumulator bet of £5 or more on any sport. Receive the same amount wagered as a free bet, up to £50. Numerous gambling operators provide promo codes with offers similar to this one for new customers. To check out more details on the Ladbrokes promo code, click here. The free bet token must be used within seven days of being awarded, otherwise it will expire. The free bet is only granted when the wager is made at odds of 1/2 or more. If the free bet is won, the stake is not included in the return. Ladbrokes terms also stipulate that the free bet must be used in its entirety, and cannot be split into multiple stakes. This particular bonus applies only to sports wagers. For fans of casino games, including slots, this bonus offers new customers £50 in bonus funds when they stake at least £10. You can then use the bonus on casino favourites such as Blackjack and Roulette, as well as slots and a host of other games. While the lure of bonus credit is always eye-catching for new casino customers, there are some strict terms and conditions to take note of as part of this Ladbrokes bonus. Sign up for a new casino account. Enter the promo code when prompted. Make a bet of at least £10 on qualifying casino/slots games. Minimum £10 bet must be made on qualifying casino/slots games. You must turn over 40x times before withdrawals can take place. This must occur within 30 days of new customers claiming the bonus. Bets covering 70% or more of Roulette table don’t count towards wagering requirements. The bonus amount credited to the new customer’s account cannot be withdrawn at any time. Offer applies only to new customers of a real money account. The Ladbrokes terms also state that the casino welcome bonus can only be used on Ladbrokes casino, live casino and slots products. Important info: 18+. New real money customers only. First deposit only. Paid as tickets and pending bonus. Bonus funds released with point accumulation. 90 days to accumulate points. Freeroll tickets valid for 2 months. Twister tickets valid for 1 month. Tournament tickets valid for 2 months. Cash table ticket valid for 30 days. T&Cs apply. New online poker players are treated to a Ladbrokes bonus that sees their first deposit doubled, up to £1200. While this seems a quick way for poker players to build up their bankroll, the Ladbrokes terms on this offer stipulate that bonus funds are released in increments, as players earn a certain amount of status points at ring games and poker tournaments. The Ladbrokes bonus for new poker customers is claimed once customers make their first deposit, and does not require a promo code for activation. Sign up for a new account with Ladbrokes Poker. Making a minimum deposit of £50. Bonus funds amounting to 200% of the deposit will become available as status points are earned. Given the large amount of potential free funds on offer as part of this Ladbrokes bonus, it’s not surprising that some specific Ladbrokes terms, particularly rules related to earning status points, need to be understood before you can get the full bonus. This bonus is valid only to customers making their first deposits with Ladbrokes poker. The first deposit is released incrementally as players earn status points. Status points are awarded to players when they contribute money to the pot during ring games or tournaments, provided the hand is raked, as well as from entry fees to tournaments. £5 of bonus funds are automatically released for every 275 status points earned. Players have 90 days to accumulate the amount of points required to release the total amount of the first deposit sign-up bonus funds. Freeroll tickets valid for 2 months, Twister tickets valid for 1 month, Tournament tickets valid for 2 months, and Cash table tickets valid for 30 days. 18+. New customers only. Available for 7 days from registration. Min deposit and spend £10 on bingo tickets. Bonus credited as £40 bingo bonus with 2x wagering, bonus valid for 7 days. T&Cs apply. The bookie welcomes new customers who deposit £10 or more on bingo tickets with a two-tiered bonus package that totals £30. The sign-up offer sees £25 of this offer allocated to bingo, with the remaining £5 a casino games bonus. Customers accessing Ladbrokes via desktop or mobile are eligible for this bonus. Click the ‘Register Now’ button on Ladbrokes bingo and create a new account. Visit the bingo lobby and create a chat name. Add details of payment method. Deposit £10 or more on bingo tickets. A message will appear in a pop-up window confirming the Ladbrokes bonus (new customers need to ensure their pop-up blocker is turned off). This bonus is only valid on £10 (or more) deposits made into the Ladbrokes ‘Main’ bingo wallet. At least £100 worth of bingo wagers must be made before the any winnings from the bingo bonus can be withdrawn. At least £125 worth of casino game wagers can be made before any winnings from the casino games bonus can be withdrawn. The bonus must be wagered within seven days from acceptance, with any remaining bonus removed after this period. The offer expires on January 3, 2017. Customers wanting to know more about any Ladbrokes bonus or Ladbrokes terms can contact the bookmaker’s support team via a variety of mediums. Support agents can be contacted via phone 24 hours a day and seven days a week. The number to call from the UK is 0800 032 1133, while calls from outside the UK should be made to +350 200 43003. If customers prefer to email, general and promotion enquires can be directed to care@ladbrokesgames.com. There is also a 24/7 live chat service that can be accessed via the ‘Contact Us’ section of the Ladbrokes website. Check that the sites you register on are licensed in your country of residence. Copyright © 2019 https://bemybet.com. All rights reserved.